2015 has to be about one thing: calm. I want to find the balance and harmony that my life for as long as I’ve known has lacked. I need to be kind to others. One who learns from her mistakes, someone who is not perfect, but can be forgiven. Most of all, I need to be kind to myself. I need to allow myself time – to meditate, to bathe, to run, to exfoliate, to explore again and ultimately learn to relax. January usually marks the start of a diet, but for me, it’s a lifestyle. Two years ago I did the unimaginable and lost weight and got fit; there were so many ups and downs, and a period of adjustment that didn’t sit comfortably. 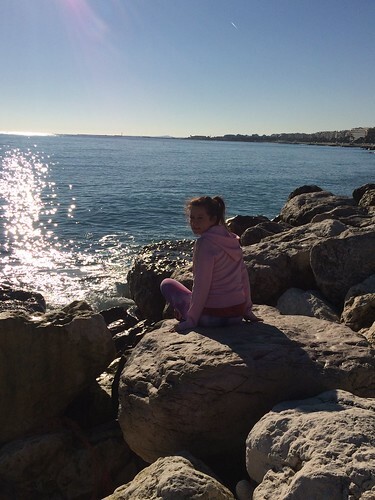 My main aim for my body is to be fit, healthy and in good shape – this photo was taken on New Year’s Day, just after completing a 4mile run in Nice, in which I tuck a tumble, which reminded me that my body is not unbreakable, but I am stronger than I ever thought I was. If I had one wish this year, it would be for all of my own conflicts and troubles of the past to be finally written off. As Elsa taught me, simply Let It Go. Happy New Year - I hope 2015 is calming and refreshing for you. All the best for 2015 - you certainly deserve it! Happy new year! Hope I get to see you at some point!